Right now there are about 7.3 billion people in the world and more than 3 billion people that have Internet access. YouTube is the second largest search engine on the Internet and it has over 1 billion users (almost 1/3 of all the people on the Internet). There are about 4 billion video views on YouTube every day and 1 billion video views are from mobile alone. Did you know that today (October 7, 2015) Wiz Khalifa featuring Charlie Puth with his song “See You Again” (Furious 7 Soundtrack) became the 10th video that passed 1 billion views on YouTube? Yes, it’s pretty weird how 10 YouTube videos succeeded to pass 1 billion views in only 10 years since YouTube has been launched. Korean singer Psy and his phenomenal song “Gangnam Style” became the first video ever to hit 1 billion views on YouTube in December 2012, only 6 months after it had been published. After 2 years (June 2014), this song became the first (and only song at the moment) that had reached 2 billion views on YouTube. 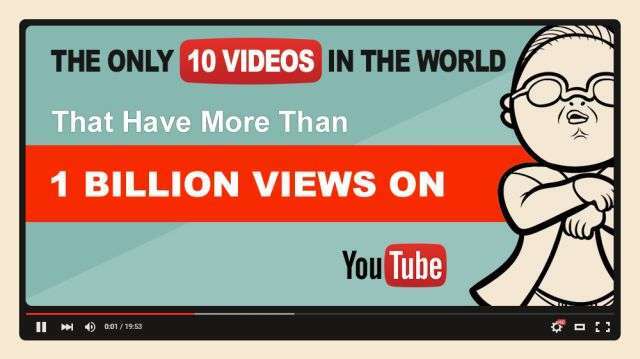 In the YouTube infographic below made by Hot in Social Media, you can see all the 10 videos that have more than 1 billion views on YouTube. Which video from this (historical) YouTube top is your favorite and which one you really can’t stand?